"C60" and "C-60" redirect here. Fullerenes are a family of carbon allotropes (other allotropes of carbon are graphite and diamond) consisting of molecules composed entirely of carbon atoms arranged in the form of hollow spheres, ellipsoids, or tubes. Each molecule generally has both pentagonal and hexagonal faces. The most common fullerene is Buckminsterfullerene, in which each molecule is composed of 60 carbon atoms that together take the shape of a soccer ball. It was named after Richard Buckminster Fuller, because its shape resembles Fuller's design of a geodesic dome. By extension, spherical fullerenes are often called buckyballs, and cylindrical ones are called buckytubes, or, more accurately, carbon nanotubes. Fullerenes are similar in structure to graphite, which is composed of stacked sheets of linked hexagonal rings. In the case of a fullerene, however, the presence of pentagonal (or sometimes heptagonal) rings prevents its sheets from being planar. Chemists can now produce various derivatives of fullerenes. For example, hydrogen atoms, halogen atoms, or organic functional groups can be attached to fullerene molecules. Also, metal ions, noble gas atoms, or small molecules can be trapped in the cage-like structures of fullerene molecules, producing complexes that are known as endohedral fullerenes. If one or more carbon atoms in a fullerene molecule is replaced by metal atoms, the resultant compound is called a fulleride. Some doped fullerenes (doped with potassium or rubidium atoms, for example) are superconductors at relatively high temperatures. Potential applications of fullerenes include the preparation of pharmaceuticals, lubricants, catalysts, and superconductors. A model of the icosahedral fullerene C540. A model of Buckminsterfullerene, C60, showing ground state electron density. Buckminsterfullerene (C60) was named after Richard Buckminster Fuller, a noted architectural modeler who popularized the geodesic dome. Since buckminsterfullerenes have a similar shape to that sort of dome, the name was thought to be appropriate. As the discovery of the fullerene family came after buckminsterfullerene, the shortened name "fullerene" was used to refer to the family of fullerenes. In 1970, Eiji Osawa of Toyohashi University of Technology predicted the existence of C60 molecules. 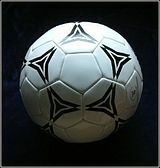 He noticed that the structure of a corannulene molecule was a subset of a soccer-ball shape, and he made the hypothesis that a full ball shape could also exist. His idea was reported in Japanese magazines, but did not reach Europe or America. In molecular beam experiments, discrete peaks were observed corresponding to molecules with the exact masses of 60, 70, or more carbon atoms. In 1985, Harold Kroto (then at the University of Sussex), James R. Heath, Sean O'Brien, Robert Curl, and Richard Smalley, of Rice University, discovered C60, and shortly thereafter discovered other fullerenes. The first nanotubes were obtained in 1991. Kroto, Curl, and Smalley were awarded the 1996 Nobel Prize in Chemistry for their roles in the discovery of this class of compounds. Minute quantities of the fullerenes—in the form of C60, C70, C76, and C84 molecules—have been found in soot and in the residue of carbon arc lamps. These molecules are also produced by lightning discharges in the atmosphere. Some analyses indicate that they are present in meteorites and interstellar dust. Recently, Buckminsterfullerenes were found in a family of minerals known as Shungites in Karelia, Russia. A common method used to produce fullerenes is to send a large current between two nearby graphite electrodes in an inert atmosphere. The resultant carbon plasma arc between the electrodes cools into sooty residue from which many fullerenes can be isolated. By 1991, it became relatively easy to produce gram-sized samples of fullerene powder using the techniques of Donald Huffman and Wolfgang Krätschmer. However, purification of fullerenes remains a challenge. Buckminsterfullerene (IUPAC name (C60-Ih)[5,6]fullerene) is the smallest fullerene molecule in which no two pentagons share an edge (which can be destabilizing). It is also the most common in terms of natural occurrence, as it can often be found in soot. The structure of C60 is a truncated (T = 3) icosahedron, which resembles a soccer ball of the type made of twenty hexagons and twelve pentagons, with a carbon atom at the vertices of each polygon and a bond along each polygon edge. 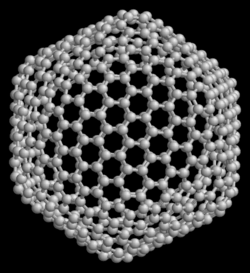 The van der Waals diameter of a C60 molecule is about 1 nanometer (nm). The nucleus to nucleus diameter of a C60 molecule is about 0.7 nm. The C60 molecule has two bond lengths. The 6:6 ring bonds (between two hexagons) can be considered "double bonds" and are shorter than the 6:5 bonds (between a hexagon and a pentagon). A new type of buckyball utilizing boron atoms instead of the usual carbon has been predicted and described by researchers at Rice University. The B-80 structure is predicted to be more stable than the C-60 buckyball. One reason for this given by the researchers is that the B-80 is actually more like the original geodesic dome structure popularized by Buckminster Fuller which utilizes triangles rather than hexagons. 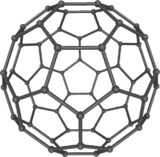 Besides C60, a fairly common buckyball is C70, but fullerenes with 72, 76, 84, and even up to 100 carbon atoms are commonly obtained. In mathematical terms, the structure of a fullerene is a trivalent convex polyhedron with pentagonal and hexagonal faces. 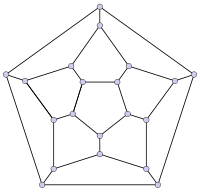 In graph theory, the term fullerene refers to any 3-regular, planar graph with all faces of size 5 or 6 (including the external face). It follows from Euler's polyhedron formula, |V|-|E|+|F| = 2, (where |V|, |E|, |F| indicate the number of vertices, edges, and faces), that there are exactly 12 pentagons in a fullerene and |V|/2-10 hexagons. The smallest fullerene is the dodecahedron—the unique C20. There are no fullerenes with 22 vertices. The number of fullerenes C2n grows with increasing n = 12,13,14…, roughly in proportion to n9. 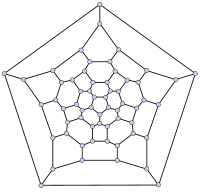 For instance, there are 1812 non-isomorphic fullerenes C60. Note that only one form of C60, the buckminsterfullerene alias truncated icosahedron, has no pair of adjacent pentagons (the smallest such fullerene). To further illustrate the growth, there are 214,127,713 non-isomorphic fullerenes C200, 15,655,672 of which have no adjacent pentagons. Trimetasphere carbon nanomaterials were discovered by researchers at Virginia Tech and licensed exclusively to Luna Innovations. This class of novel molecules comprises 80 carbon atoms (C80) forming a sphere which encloses a complex of three metal atoms and one nitrogen atom. These fullerenes encapsulate metals which puts them in the subset referred to as metallofullerenes. Trimetaspheres have the potential for use in diagnostics (as safe imaging agents), therapeutics and in organic solar cells. This animation of a rotating Carbon nanotube shows its 3D structure. Nanotubes are cylindrical fullerenes. These tubes of carbon are usually only a few nanometers wide, but they can range from less than a micrometer to several millimeters in length. They often have closed ends, but can be open-ended as well. There are also cases in which the tube reduces in diameter before closing off. Their unique molecular structure results in extraordinary macroscopic properties, including high tensile strength, high electrical conductivity, high ductility, high resistance to heat, and relative chemical inactivity (as it is cylindrical and "planar"—that is, it has no "exposed" atoms that can be easily displaced). One proposed use of carbon nanotubes is in paper batteries, developed in 2007 by researchers at Rensselaer Polytechnic Institute. Another proposed use in the field of space technologies and science fiction is to produce high-tensile carbon cables required by a space elevator. Nanobuds have been obtained by adding Buckminsterfullerenes to carbon nanotubes. For the past decade, the chemical and physical properties of fullerenes have been a hot topic in the field of research and development, and are likely to continue to be for a long time. Popular Science has published articles about the possible uses of fullerenes in armor. 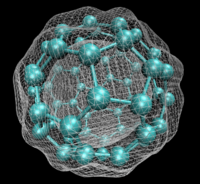 In April 2003, fullerenes were under study for potential medicinal use: Binding specific antibiotics to the structure to target resistant bacteria and even target certain cancer cells such as melanoma. The October 2005 issue of Chemistry and Biology contains an article describing the use of fullerenes as light-activated antimicrobial agents. In the field of nanotechnology, heat resistance, and superconductivity are some of the more heavily studied properties. There are many calculations that have been done using ab initio Quantum Methods applied to fullerenes. By density functional theory (DFT) and Time-dependent density functional theory (TD-DFT) methods, one can obtain IR, Raman and UV spectra. Results of such calculations can be compared with experimental results. Researchers have been able to increase the reactivity of fullerenes by attaching active groups to their surfaces. Buckminsterfullerene does not exhibit "superaromaticity:" That is, the electrons in the hexagonal rings do not delocalize over the whole molecule. A spherical fullerene of n carbon atoms has n pi-bonding electrons. These should try to delocalize over the whole molecule. The quantum mechanics of such an arrangement should be like one shell only of the well-known quantum mechanical structure of a single atom, with a stable filled shell for n = 2, 8, 18, 32, 50, 72, 98, 128, and so on; that is, twice a perfect square; but this series does not include 60. As a result, C60 in water tends to pick up two more electrons and become an anion. The nC60 described below may be the result of C60's trying to form a loose metallic bonding. Fullerenes are stable, but not totally unreactive. They are unusual reactants in many organic reactions such as the Bingel reaction discovered in 1993. Planar graphite is made up of carbon atoms that are at their energy minimum, with outer orbitals that are said to be "sp2-hybridized." These orbitals must be bent to form the closed sphere or tube of a buckyball or buckytube, producing angle strain. The characteristic reaction of fullerenes is electrophilic addition at 6,6-double bonds, which reduces angle strain by changing sp2-hybridized carbons into sp3-hybridized ones. The change in hybridized orbitals causes the bond angles to decrease from about 120 degrees in the sp2 orbitals to about 109.5 degrees in the sp3 orbitals. This decrease in bond angles allows for the bonds to bend less when closing the sphere or tube, and thus, the molecule becomes more stable. Other atoms can be trapped inside fullerenes to form inclusion compounds known as endohedral fullerenes. An unusual example is the egg shaped fullerene Tb3N@C84, which violates the isolated pentagon rule. Recent evidence for a meteor impact at the end of the Permian period was found by analyzing noble gases so preserved. Fullerenes are sparingly soluble in many solvents. Common solvents for the fullerenes include aromatics, such as toluene, and others like carbon disulfide. Solutions of pure Buckminsterfullerene have a deep purple color. Solutions of C70 are a reddish brown. The higher fullerenes C76 to C84 have a variety of colors. C76 has two optical forms, while other higher fullerenes have several structural isomers. Fullerenes are the only known allotrope of carbon that can be dissolved in common solvents at room temperature. Some fullerene structures are not soluble because they have a small band gap between the ground and excited states. These include the small fullerenes C28, C36 and C50. The C72 structure is also in this class, but the endohedral version with a trapped lanthanide-group atom is soluble due to the interaction of the metal atom and the electronic states of the fullerene. Researchers had originally been puzzled by C72 being absent in fullerene plasma-generated soot extract, but found in endohedral samples. Small band gap fullerenes are highly reactive and bind to other fullerenes or to soot particles. Solvents that are able to dissolve buckminsterfullerene (C60) are listed below in order from highest solubility. The value in parentheses is the approximate saturated concentration. Solubility of C60 in some solvents shows unusual behavior due to existence of solvate phases (analogues of crystallohydrates). For example, solubility of C60 in benzene solution shows maximum at about 313 K. Crystallization from benzene solution at temperatures below maximum results in formation of triclinic solid solvate with four benzene molecules C60•4C6H6 which is rather unstable in air. Out of solution, this structure decomposes into usual fcc C60 in few minutes' time. At temperatures above solubility maximum the solvate is not stable even when immersed in saturated solution and melts with formation of fcc C60. Crystallization at temperatures above the solubility maximum results in formation of pure fcc C60. Large millimeter size crystals of C60 and C70 can be grown from solution both for solvates and for pure fullerenes. When considering toxicological data, care must be taken to distinguish as necessary between what are normally referred to as fullerenes: (C60, C70,…); fullerene derivatives: C60 or other fullerenes with covalently bonded chemical groups; fullerene complexes (for example, C60-PVP, host-guest complexes), where the fullerene is physically bound to another molecule; C60 nanoparticles, which are extended solid-phase aggregates of C60 crystallites; and nanotubes, which are generally much larger (in terms of molecular weight and size) compounds, and are different in shape to the spheroidal fullerenes C60 and C70, as well as having different chemical and physical properties. The above different compounds span the range from insoluble materials in either hydrophilic or lipophilic media, to hydrophilic, lipophilic, or even amphiphilic compounds, and with other varying physical and chemical properties. Therefore any broad generalization extrapolating for example results from C60 to nanotubes or vice versa is not possible, though technically all are fullerenes, as the term is defined as a close-caged all-carbon molecule. Any extrapolation of results from one compound to other compounds must take into account considerations based on a Quantitative Structural Analysis Relationship Study (QSARS), which mostly depends on how close the compounds under consideration are in physical and chemical properties. In 1996 and 1997, Moussa et al. studied the in vivo toxicity of C60 after intra-peritoneal administration of large doses. No evidence of toxicity was found and the mice tolerated a dose of 5 000 mg/kg of body weight (BW). Mori et al. (2006) could not find toxicity in rodents for C60 and C70 mixtures after oral administration of a dose of 2 000 mg/kg BW and did not observed evidence of genotoxic or mutagenic potential in vitro. Other studies could not establish the toxicity of fullerenes: On the contrary, the work of Gharbi et al. (2005) suggested that aqueous C60 suspensions failing to produce acute or subacute toxicity in rodents could also protect their livers in a dose-dependent manner against free-radical damage. A comprehensive and recent review on fullerene toxicity is given by Kolosnjaj et al. (2007a,b, c). These authors review the works on fullerene toxicity beginning in the early 1990s to present, and conclude that very little evidence gathered since the discovery of fullerenes indicate that C60 is toxic. With reference to nanotubes, a recent study of Poland et al. (2008) on carbon nanotubes introduced into the abdominal cavity of mice led the authors to suggest comparisons to "asbestos-like pathogenicity." It should be noted that this was not an inhalation study, though there have been several performed in the past, therefore it is premature to conclude that nanotubes should be considered to have a toxicological profile similar to asbestos. Conversely, and perhaps illustrative of how the various classes of compounds which fall under the general term fullerene cover a wide range of properties, Sayes, et al., found that in vivo inhalation of C60(OH)24 and nano-C60 in rats gave no effect, whereas in comparison quartz particles produced an inflammatory response under the same conditions (Nano Letters, 2007, Vol. 7, No. 8, 2399-2406). As stated above, nanotubes are quite different in chemical and physical properties to C60, i.e., molecular weight, shape, size, physical properties (such as solubility) all are very different, so from a toxicological standpoint, different results for C60 and nanotubes are not suggestive of any discrepancy in the findings. In 1999, researchers from the University of Vienna demonstrated the wave-particle duality applied to molecules such as fullerene. One of the co-authors of this research, Julian Voss-Andreae, became an artist and has since created several sculptures symbolizing wave-particle duality in Buckminsterfullerenes. Science writer Marcus Chown stated on the CBC radio show, Quirks And Quarks, in May 2006, that scientists are trying to make buckyballs exhibit the quantum behavior of existing in two places at once (quantum superposition). Fullerites are the solid-state manifestation of fullerenes and related compounds and materials. Polymerized single-walled nanotubes (P-SWNT) are a class of fullerites and are comparable to diamond in terms of hardness. However, due to the way that nanotubes intertwine, P-SWNTs do not have the corresponding crystal lattice that makes it possible to cut diamonds neatly. This same structure results in a less brittle material, as any impact that the structure sustains is spread out throughout the material. Because nanotubes are still very expensive to produce in useful quantities, uses for a material lighter and stronger than steel will have to wait until nanotube production becomes more economically viable. Ultrahard fullerite (C60) is a form of carbon synthesized under high pressure high temperature conditions. It is believed that fullerene molecules are three-dimensionally polymerized in this material. ↑ H.W. Kroto, J.R. Heath, S.C. O'Brien, R.F. Curl, and R.E. Smalley, C60: Buckminsterfullerene, Nature 318: 162–163. ↑ Machine Design, A new buckyball bounces into town. Retrieved October 21, 2008. ↑ ASU, World of Carbon, The Allotropes of Carbon. Retrieved October 21, 2008. ↑ Gary L. Miessler and Donald A. Tarr, Inorganic Chemistry (Upper Saddle River, NJ: Pearson Education International, 2004, ISBN 0131201980). ↑ D.R. Mitchel, et al., The Synthesis of Megatubes: New Dimensions in Carbon Materials, Inorg. Chem. 40: 2751. ↑ N. Sano, Synthesis of carbon "onions" in water, Nature (London) 414: 506. ↑ A.A. Shvartsburg, Observation of “Stick” and “Handle” Intermediates along the Fullerene Road, J. Phys. Chem. 103: 5275. ↑ Y. Li, et al., Structures and stabilities of C60-rings, Chem. Phys. Lett. 335: 524. ↑ Jade Boyd, Bucky's brother—The boron buckyball makes its début, eurekalert.org. Retrieved October 21, 2008. ↑ bristol.ac.uk, Buckminsterfullerene: Molecule of the Month. Retrieved October 21, 2008. ↑ V.L. Pushparaj, M.M. Shaijumon, A. Kumar, S. Murugesan, L. Ci, R. Vajtai, R.J. Linhardt, O. Nalamasu, and P.M. Ajayan, Flexible energy storage devices based on nanocomposite paper, Proceedings of the National Academy of Sciences 104(34): 13574. ↑ G. Tegos and T. Demidova, D. Arcila-Lopez, H. Lee, T. Wharton, H. Gali, and M. Hamblin, 2005, Cationic Fullerenes Are Effective and Selective Antimicrobial Photosensitizers, Chemistry & Biology 12(10): 1127–1135. Retrieved October 21, 2008. ↑ C.M. Beavers, T. Zuo, J.C. Duchamp, K. Harich, H.C. Dorn, M.M. Olmstead, and A.L. Balch, Tb3N@C84: An improbable, egg-shaped endohedral fullerene that violates the isolated pentagon rule, Journal of the American Chemical Society 128(35): 11352–3. ↑ Luann Becker and Robert J. Poreda, Andrew G. Hunt, Theodore E. Bunch, and Michael Rampino, 2007, Impact Event at the Permian-Triassic Boundary: Evidence from Extraterrestrial Noble Gases in Fullerenes, Science 291(5508): 1530–3. ↑ Ting Guo, Richard E. Smalley, and Gustavo E. Scuseria, Ab initio theoretical predictions of C28, C28H4, C28F4, (Ti at C28)H4, and M at C28 (M = Mg, Al, Si, S, Ca, Sc, Ti, Ge, Zr, and Sn), Harvard. Retrieved October 21, 2008. ↑ V.N. Bezmel'nitsyn, A.V. Eletskiĭ, and M.V. Okun', Uspekhi Fizicheskikh Nauk. (Fullerenes in Solutions). Russian Academy of Sciences 41. ↑ A.V. Talyzin, Phase transition C60-C60*4C6H6 in liquid benzene, J. of Phys. Chem. 101(47). ↑ A.V. Talyzin, I. Engstrцm, C70 in a Benzene, Hexane and Toluene solutions, J. of Phys. Chem. 102(34): 6477–6481. ↑ F. Moussa, et al., In vivo studies of fullerene-based materials using endohedral metallofullerene radiotracers, Fullerene Sci. Technol. 4: 21–29. ↑ T. Mori, et al., Preclinical studies on safety of fullerene upon acute oral administration and evaluation for no mutagenesis, Toxicology 225: 48–54. ↑ Najla Gharbi, M. Pressac, M. Hadchouel, H. Szwarc, S.R. Wilson, and F. Moussa, 2005, fullerene is a powerful antioxidant in vivo with no acute or subacute toxicity, Nano Letters 5(12):2578–2585. ↑ J. Kolosnjaj, et al., "13. Toxicity studies of fullerenes and derivatives," in W.C. Chan, Bioapplications of nanoparticles (Toronto, CA: Landes Biosciences, 2006), 168-180. ↑ J. Kolosnjaj, H. Szwarc, and F. Moussa, Toxicity studies of carbon nanotubes, Adv. Exp. Med. Biol. 620: 181–204. ↑ C.A. Poland, R. Duffin, I. Kinloch, A. Maynard, W.A.H. Wallace, and A. Seaton et al. 2008, Carbon nanotubes introduced into the abdominal cavity of mice show asbestos-like pathogenicity in a pilot study, Nature Nanotechnology 3: 423. ↑ M. Arndt, O. Nairz, J. Voss-Andreae, C. Keller, G. van der Zouw, and A. Zeilinger, Wave-particle duality of C60, Nature 401: 680–682. ↑ CBC, Quirks & Quarks. Retrieved October 21, 2008. ↑ Lucy Sherriff, Diamonds lose "world's hardest" title, The Register. Retrieved October 21, 2008. Aldersey-Williams, Hugh. 1995. The Most Beautiful Molecule: The Discovery of the Buckyball. Hoboken, NJ: John Wiley & Sons. ISBN 047119333X. Fowler, P.W. and D.E. Manolopoulos. 2007. An Atlas of Fullerenes. Mineola, NY: Dover Publications. ISBN 0486453626. Miessler, Gary L., and Donald A. Tarr. 2004. Inorganic Chemistry. Upper Saddle River, NJ: Pearson Education International. ISBN 0131201980. All links retrieved May 15, 2017. Center for Biological and Environmental Nanotechnology. Story on "Buckyeggs" (UC Davis website). This page was last modified on 15 May 2017, at 21:12.